The I.D. Crozz offers a feature that few - if any - vehicles possess: Headlights that can wink, squint, and even stare at people and objects. 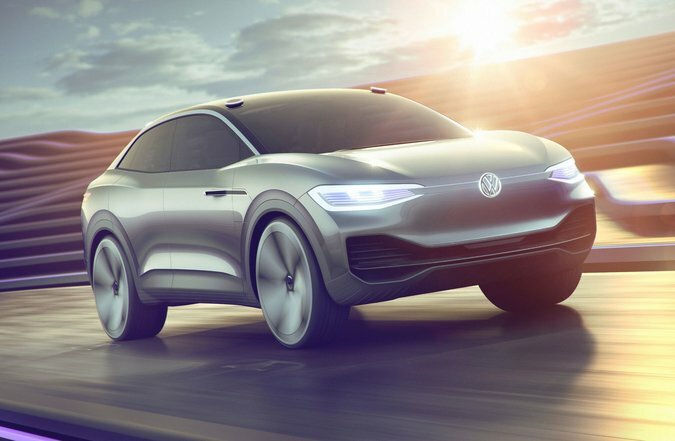 This exterior lighting feature, while quirky and a bit odd, is a neat way for VW to bring attention to the long range electric vehicle it plans to produce by 2020. Like its I.D. predecessors, the Crozz uses Volkswagen's new, EV-specific MEB platform. Its 109.2-inch wheelbase and overall length of 182.1 inches makes it dimensionally similar to the 2018 Tiguan. I.D. Crozz also enjoys greater versatility thanks to the packaging of its electric drivetrain. In order to allow taller items to fit inside the cabin, the 83-kWh lithium-ion battery is fitted under the floor and two electric motors - one at each axle - are contained within the front and rear subframes. This enables the I.D. Crozz to incorporate rear-seat cushions that tip up in a fashion similar to Honda Fit and thus allow taller items to fit. The I.D. Crozz also has an 18-cubic foot cargo hold which is accessed via a steeply angled rear hatch. Entry for passengers is either through electrically opening front door, which can swing out 90 degrees, or the electric sliding rear doors can be used. When both portals are open at the same time, the concept has no B-pillar. Once inside the car, the driver has the option to either take control of the wheel or activate the I.D. Pilot autonomous-driving mode. This is done by pressing the steering wheel's VW logo for three seconds. With the autonomous-driving mode activated, the steering wheel retracts into the dashboard, and ambient cabin lighting switches from blue to violet, four laser scanners rise from the roof, and the headlights do their best imitation of a human eye by purposefully "looking" in the direction of travel or starting at the pedestrians to make sure they are made aware of the approaching VW. In order to exit I.D. Pilot mode and take control of the car, the steering wheel logo is pressed again for three seconds or the driver can either tap the brake or accelerator pedal. Regardless of which mode the car is driving in, a trio of digital displays shows pertinent multimedia and driving information which includes feeds from the three cameras that replace the side mirrors. Power for the I.D. Crozz comes courtesy of a 101-hp front motor and a 201-hp rear motor for a combined 302 horsepower. The vehicle defaults to rear propulsion, adding the front motor only when slip is detected or if all-wheel-drive mode is desired. The top speed for I.D. Crozz is claimed at 180 kph and driving range is listed at 500.5 kilometers. The battery pack can also be recharged to 80% full in only 30 minutes with a DC fast charger. The familiar, but attractive, crossover "coupe" shape of I.D. Crozz looks promising and appears ready to help achieve Volkswagen's lofty goals of selling one million electric vehicles per year worldwide by 2050.